Sugar, Salt, and – Soap? ONE OF THE RULES OF LONG-DISTANCE RUNNING is to hydrate and fuel adequately throughout and following the run. The rule after that one ought to be: Don’t ignore the previous rule. Up at our campground near the Sleeping Bear Dunes for the Labor Day weekend, I prepared for my assigned Saturday 18-mile run. My plan was to start and finish in downtown Glen Arbor, running a set of loops that brought me back to my car every 6 miles or so, where I would stop for Gatorade and a Gu (a carbohydrate gel). Did I confirm the distances on Google Maps like I usually do? Naw, it all looked good eyeballing the map. And I had my Garmin watch with me. What could go wrong? 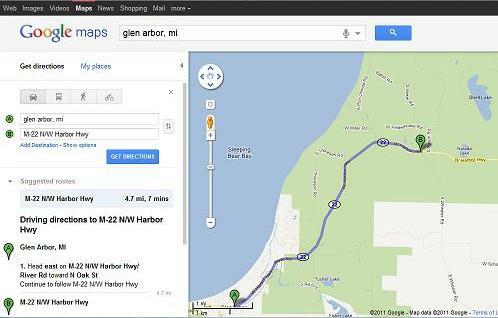 Part 1, a loop on the roads around Little Glen Lake, was perfect. At the 7-mile mark, I was back at my car downing some Powerade and a vanilla Gu. On to Part 2, a planned 6-mile loop east down M-22 toWheeler Road and around. After a second water/sugar stop, Part 3 would then be a 5-mile jog to finish the run. So it's 4.7 miles to Wheeler Road. But it looks shorter on the map! I noticed the first flaw in my plan when I stopped to remove a stone from my shoe, and saw on the Garmin that I’d already run four miles without finding Wheeler Road. At 4.5 miles out, I realized Part 2 was going to be quite a bit longer than planned. Abandoning Wheeler Road, I headed up Port Oneida Road toward Camp Kohahna, where my daughters had gone in summers past. So Part 3 would be merged into Part 2. Not a problem – I had a water bottle with me, and I’d run longer than this without a Gu. At the 6 mile mark (13 total), I stopped for water – and found my water bottle was full of suds! Apparently there had been soap residue from the last time I washed it. What I had was fine for doing dishes, but definitely out for drinking. Okay, not a problem. It was only five miles back. I’d run longer than this without. . .
Those five miles back were among the toughest I’ve ever run. Let’s just say that the Jeep was a very welcome sight. I grabbed the Powerade bottle and drank most of the remainder, then headed to the IGA to pick up a few things before heading back to camp. Problem was, I didn’t start feeling better; in fact, I got worse, feeling nauseated and unable to walk for more than a few minutes without having to sit down. Previously, a lack of salt had been the problem; this time, I’d had electrolytes and salt from some chips I bought, but I wasn’t improving. Somehow I got back to camp, where I crashed, sweaty clothes and all, on the bed. After an hour or so, I struggled to the shower and cleaned up. After another rest, I finally began to recover, and all was well after dinner. Yes, but think of all the calories I'm saving! The problem, as I’m sure you’ve figured out by now, wasn’t the salt; it was sugar. 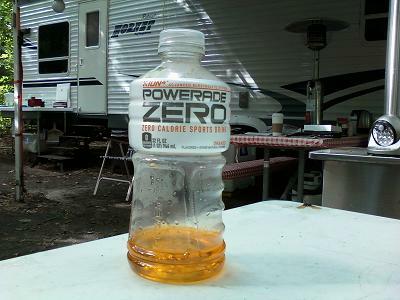 I’d been drinking Powerade ZERO – the kind with artificial sweetener – and on an empty stomach, it must have triggered an insulin reaction that drove me into hypoglycemia. I could have resolved it with a Gu, or a full-sugar Gatorade, but for whatever reason it didn’t register in my run-addled mind. So chalk up another lesson learned – at the end of a long run, refuel with both salt AND sugar. And better yet, don’t put myself in that position in the first place. Next time I will check my water first – and take a Gu with me, just in case.